Ally Carter's books tend to be hit or miss with me. I adored her Gallagher Girls series. I wasn't a fan of the Heist Society books, which really depressed me since everyone else loved them. 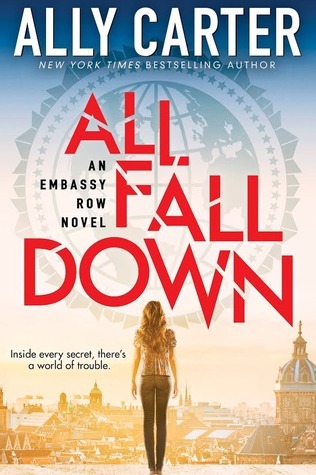 All Fall Down, the first in the Embassy Row series, is thankfully another hit. This book is part murder mystery / James Bond-ish caper, part teenage character drama, and part coming of age. Grace comes into this book as the only person who believes that her mother was murdered rather than dead of a terrible accident. Based on her personality and her actions, as an adult, I'd probably think she was delusional too. Her mental health has suffered since her mother's death, which is understandable. But her personality is more problematic. She's outspoken, impulsive, prone to jumping to conclusions, and pushes every boundary that comes upon her. This doesn't make her a bad person. In fact, I think she's a great character but from an objective standpoint, I understand why no one believes her. It becomes pretty clear to the reader over the course of the book that her mother's death was not just a tragic accident. However, I'm still not clear on what happened. This, I think will be the great mystery of the series, which will surely be very complicated and have long-reaching implications. I'm excited to see what direction it goes in. Side note - I'm really curious what country Adria is supposed to most resemble, or where exactly it is. Greece is what comes to mind, at least in terms of location. As for the character drama, Grace becomes friends with a group of diplomat's kids from various countries. This is your pretty standard YA friendship / enemy grouping. There's a handsome boy who looks after Grace because he's her brother's best friend. He has an edge that makes you think he might become an enemy although I imagine he will be the great love interest. Then there are Noah and Rosie. Noah definitely is of the best friend vibe. It might turn into love triangle territory, but so far I think Alexei will be the sole guy vying for Grace's heart. Noah is funny, goofy, and loyal. Just what you want in a YA best friend guy. He goes along with Grace's craziness but also can help keep her in control. Rosie is a tiny, cute as a button genius. She is never noticed and manages to get the best of every situation. Grace also makes a frenemy, who is the source of most of Grace's character growth. Grace has a bad habit of labeling and pigeon-holing people. Through the course of this book, she learns that not everything is black and white. Not all people are good, but not all "bad" or "useless" people are actually so. Essentially, she starts off the book less obnoxious and judgmental than she began it. My review makes it seem as though I didn't like Grace much. I really did. I like that she has flaws. She is an essentially good person who has some growing up do to. She's also spunky, funny, nervy, and great fun to be around. Overall, All Fall Down is a wonderful start to what I hope will be a fabulous series. I don't love it as much as I did the first Gallagher Girls book, but it has a lot of potential. I'm looking forward to seeing where this series goes. Recommendation: Borrow for now. Perhaps buy as the series goes on. Funny, I was the opposite with Gallagher Girls and Heist Society. I thought the GG series was a bit too young for me, but I absolutely adored the popcorn vibe I got from Heist Society. I really like how this series has a completely different tone. I totally agree with the James Bond caper comparison. I haven't read any of her books but I know the synopsis for some are hit or miss with me so I can totally understand. Glad to hear this one worked out for you. It definitely sounds like an interesting read. I tried to read this book, but I couldn't get into it. There was something about Grace's voice that was hard to relate to and I gave up after the first chapter or 2.